Our Guest Blogger today is Angela Bowman who had a mission to help start the school year organized (and sane) for the kids, and of course, her. We have all had this area in our house where we have turned a blind eye to it until we take that big deep breath and just go for it. 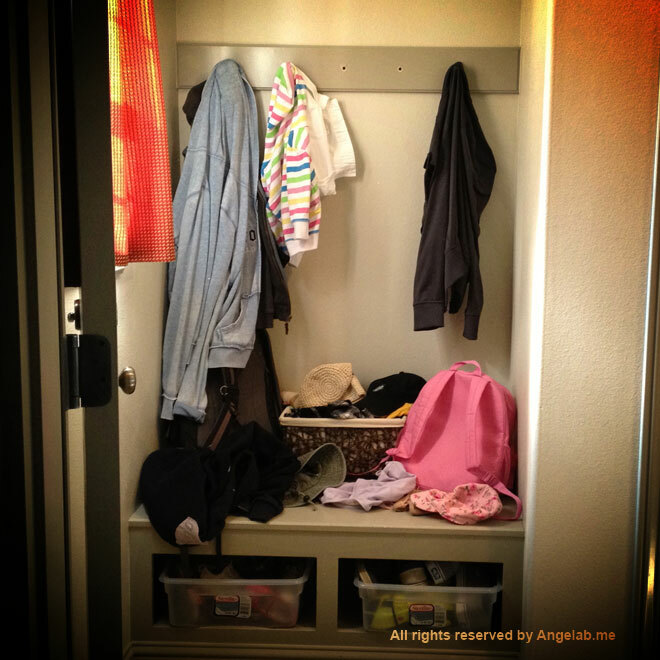 Here is Angela’s Back To School mission to turn the once named “Dumping Ground” into a nice, functional, practical, and cute, mud room area in her house. Thanks Angela for contributing! Our mudroom might be better called The Dump. A quick trip to D&B and about $22 later, I got a very nice set of hook hardware along with some mailbox numbers. 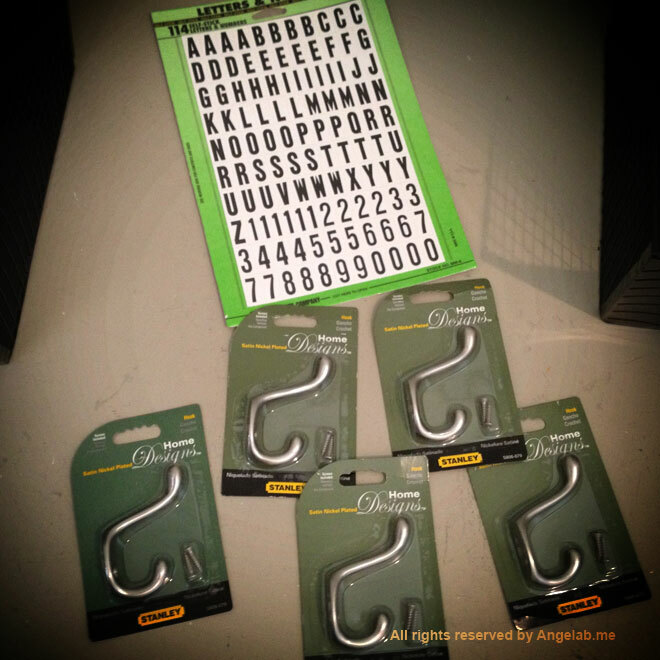 Their hardware aisle had quite a few hooks to choose from – I thought I would just get some simple hooks, but I found some nice double hooks in three different sizes and finishes. I opted for the satin nickel finish. And I’m looking forward to doubling the hanging capacity with these hooks! 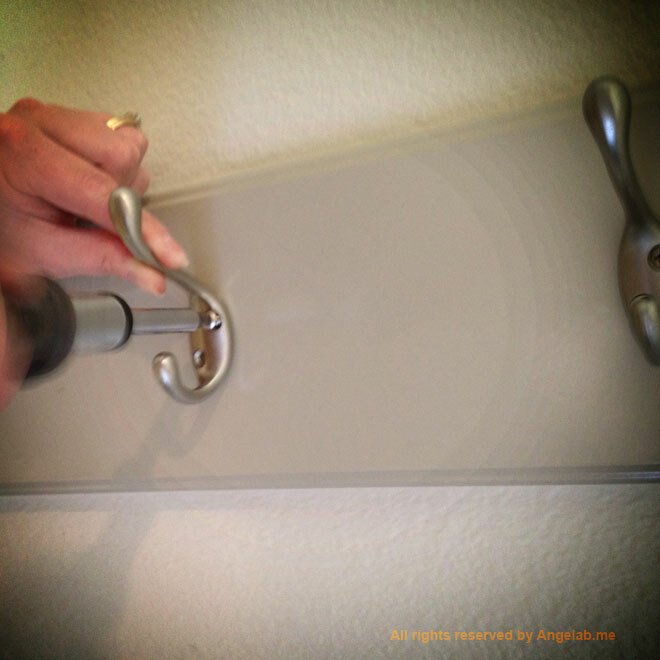 I had to cover the wimpy peg hole with my fancy new hook hardware. I just followed the directions on the back of the package, drilling a couple 5/64″ pilot holes. So fun to use power tools! Time to put these babies in. I used a Phillips screwdriver to insert the screws. It will be nice to hang heavy backpacks up there. SOOOOO much better. Why did it take me so long to do this?! It was so easy! Ok, time to get crafty. I used the mailbox stickers, some Color Duck Tape, and some decorative washi tape that I already had. By the way, D&B has tons of different colors of Duck Tape. I printed a couple pics of the kiddos, layered with mailbox stickers, and used washi tape to attach to a couple of wire baskets that I already had. And the shoe bins are nicely labeled now. Nice and neat. You can find Angela on her blog, Twitter, Google+, Pinterest, Flickr, YouTube or of course Facebook. This entry was posted in The D&B Blog and tagged Back to School. Bookmark the permalink.